Why come home to a dark house? Why let the fan run if nobody's home? Set on and off times for your lights and small appliances. Sync lights to sunrise, sunset, and other external events automatically. Turn on a light or coffee maker before you get out of bed. Make all these happen with our wi-fi smart plug. NewRice Mini Smart Plug gives you control over any plugged-in light or appliance no matter where you are. Simply access the Smart app on your phone or tablet to turn your devices on and off remotely. The smart plug allows you to create schedules to automatically power on or off your home electronics and appliances at anytime. You can create a schedule for each device any day of the week, or customize it by a specific time in a day. So you walk into a brightly-lit home every day after work with your favorite song playing. The smart plug compatible with Amazon Alexa so you can manage your devices with your voice. Assign a name to each plug and use it when making voice commands. You can also create a group for your smart devices and control all of them with one command. 1) DUAL USB CHARGER PORTS- 5V 2A automatic allocation between the two USB ports, Offer Various Equipment Energy Supply at a fast speed of 2A for each USB Port, meet the demand of daily charge, and compatible with plug-in interface at the same time. Anyone You Can Use Anywhere. (Note that USB Does not Support Remote Control, Unfeasible to Control USB Switch by App). 2) SECURITY & CONVENIENCE DESIGN- 360 Rotatable Cap and Hidden Jacks design which help to Prevent your Children's Safety; Rotary Switch let you turn on/off your fixtures connected to the smart plug by simply Rotate its cap; The Cool Starlight Concept Indicator will bring you the brightness in the dark and make your life more convenient and cool. 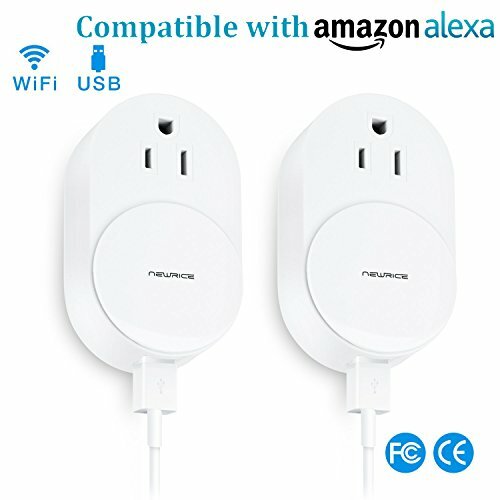 3) REMOTE & VOICE CONTROL- You can control your lights and appliances connected to the Smart Plug on or off wherever you have Internet from your Smartphone or tablet by using the free Smart app. Control your devices globally with Wi-Fi access. No Hub or monthly fees required; Compatible with Amazon Alexa for voice control, instantly turn on or off devices by voice control with Amazon Alexa (Alexa device sold separately), NOTE: Requires a neutral wire for installation! 4) TIMING FUCTION- Schedule the Smart Outlet to automatically power electronics on and off based on specific time you set; Power saving eliminate wasteful standby power and prevent overcharging and overheating save on your electric bills and extend product life. 5) SATISFACTION GUARANTEE- The smart plug FCC and CE approved for safety and quality assurance, safe in use, We offer you 100% Risk Free Satisfaction Guarantee and 1 year warranty to let you buy with confidence. In case any problem happens to the plug, contact the seller of us without hesitation to solve the problem until satisfaction. If you have any questions about this product by NewRice, contact us by completing and submitting the form below. If you are looking for a specif part number, please include it with your message.